The Winnipeg Jets have missed their biggest— both figuratively and literally — blue line presence for all but five games between late December and Saturday; the man whose unique skillset boosts nearly every aspect of their game. However, the man they call “Big Buff” is back in action, and it couldn’t have come at a better time, with the Stanley Cup Playoffs less than two weeks away. Byfuglien’s been limited to just 38 games this season due to a concussion and pair of ankle injuries. He sustained the first on Dec. 29 after an innocent-looking collision with the Minnesota Wild’s Luke Kunin and the second on Feb. 14 against the Colorado Avalanche after being back for just five games from the first one. The first injury kept the Minnesotan out of the lineup for 15 games. The second injury was originally pitched as day-to-day, but days stretched into weeks and forced him to miss a further 19 games. Those ailments derailed his resurgent season. After a 2017-18 season in which he recorded 45 points — tied for his lowest in an 82-game season in nearly a decade — Byfuglien has already put up 30 in 2018-19, and would have been on pace for more than 60 if he’d been healthy all season. He’s dished out 68 hits and his possession metrics have been solid. He’s been on the ice for 57 goals for and just 37 goals against. In his return Saturday night versus the Montreal Canadiens, Byfuglien played 24:24, threw three hits, and rang a shot off the post. The below chart of the Jets’ five-on-five goal differential shows how integral Byfuglien is. This season, when he’s in the lineup, the Jets score about as many goals at even strength as they give up. He has long since abandoned the reckless playstyle, the impulsive pinches, and the suspect passes that characterized him in earlier Jets’ seasons and made him a lightning rod for criticism. 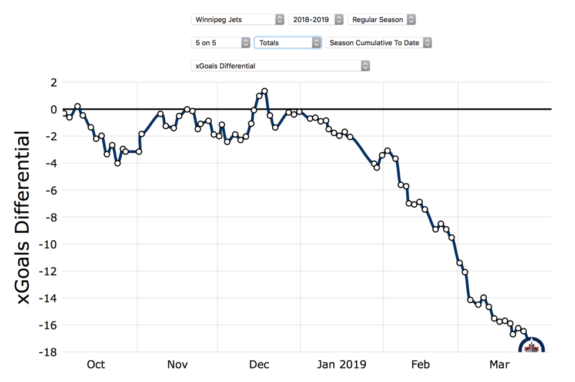 You can clearly see that, after Byfuglien’s first injury in late December the Jets’ five-on-five goal differential falls off a cliff. One can see that between late December and March 30 — where Byfuglien missed all but five games — the Jets’ five-on-five goal differential falls off a cliff. One of the reasons for that is because the Jets give up a lot of chances off the rush — ones that often lead to goals — when he’s out. The deadline-day defensive additions the Jets made have kept them atop of the Central Division, but have not brought the same quality of defensive play Byfuglien provides. To put it pithily, the more often opponents are dumping it in, the fewer high-danger scoring chances they’ll get, which should lead to fewer goals in the Jets net. Opponents this season have also attempted controlled entries against Byfuglien less frequently than against any other defenseman. Part of this is simply because they’re scared of being blown up by a signature Byfuglien body check— Mark Stone and Joel Eriksson Ek can both attest to what can happen to a player when they try to carry the puck into, or possess it, in the o-zone and Byfuglien decides to steps up. Other factors that contribute to the lack of controlled entries against Byfuglien is that his huge 6-foot-5, 250-pound frame is just hard to get around, and that he can also separate a man from the puck using his long reach in addition to his body. Additionally, Byfuglien should help the Jets lock down third-period leads, something they’ve had a boatload of trouble doing this season. Late-game collapses are now a trend with the Jets: look to last-minute blown leads against the Minnesota Wild, San Jose Sharks, and New York Islanders as recent examples. They’ve lost eight games when leading after two this season, compared to just two last season. If the alarming trend continues into the playoffs, they’ll be destined for an early exit. Opposing goaltenders beware: the man with the point cannon is back on the blue line. Byfuglien’s patented point shot is a major contributor to the Jets power play’s dynamism. When healthy, Byfuglien quarterbacks the first unit, and opponents have to respect (even though he only has one power play goal this season) that he may tee the puck up and let it fly instead of dishing it to Patrik Laine for a one-timer or to Blake Wheeler on the right-side boards. With Josh Morrissey also out, Jacob Trouba’s taken on the role as power play QB. While he has offensive upside, opponents don’t respect his shot as much because it often goes wide. 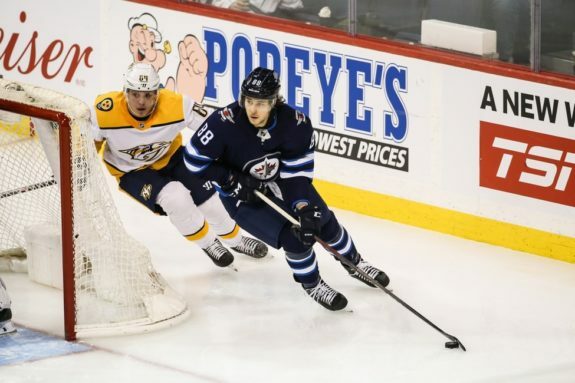 Opponents are perfectly alright surrendering a shot to Trouba, which allows them to key on the Jets forwards and stifle the other plays that make them successful — the cross-ice pass from Wheeler to Laine or a quick high-slot one-time chance for Mark Scheifele. Byfuglien’s Shots Through Percentage (the number of shot attempts that go on goal) is 51.2 per cent this season, way higher than Trouba’s 43.5 per cent clip. The more point shots that actually hit the net, the more rebounds Scheifele, Wheeler, Laine, and Kyle Connor will have to pounce on, adding yet another element of danger. 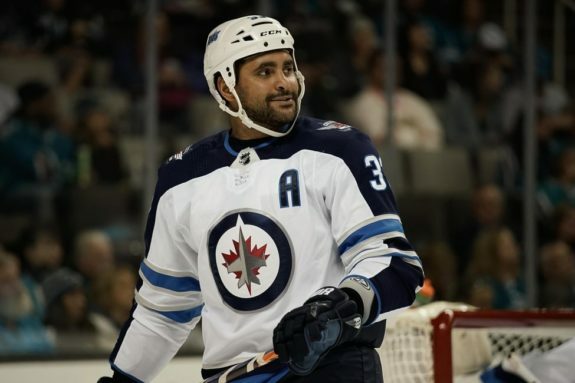 It seems the Jets are easing Byfuglien back into this role, as on Saturday against the Canadiens, he was slotted on the second unit while Trouba continued to be slotted on the first (the Jets didn’t actually get a power play in the game.) Come playoffs, though, expect Buff and his cannon to roll with the big guns. Byfuglien is a variable other teams simply don’t possess. He’s a five-tool guy whose diverse skillset makes him without equal in the NHL and this allows him to impact a game — or flat-out commandeer it — in countless ways. Earlier in the week, his teammates praised him as such. “Other teams play differently when he’s in the lineup,” Andrew Copp said. “Dustin brings a presence that no one else can in this league. He makes guys fear a little bit,” Connor Hellebuyck added. His teammates aren’t just realizing this now. In the playoffs last spring, Byfuglien was an absolute force and showcased every one of his skills, night-in and night-out, on the team’s run to the Western Conference Final. He put up five goals and 11 assists in 17 games, was ferociously physical, strong defensively, and gobbled up an average time on ice of 26:30. He created memorable moments such as when he simultaneously plucked Tomas Nosek and Colin Miller out of a scrum like a bouncer breaking up a bar fight. Indeed, Byfuglien can do it all, and his return fundamentally and drastically changes the Jets’ fortunes on defense and their on-ice dynamic. 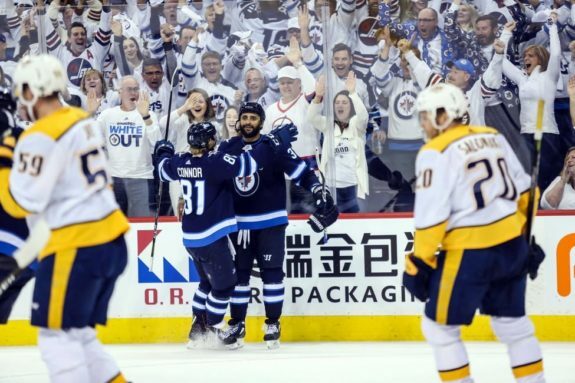 With the playoffs — where every game is a dogfight — and Whiteout on the horizon, Byfuglien is the shot in the arm that could help the Jets go into the postseason on a good note and boost their chances at another lengthy run.